The Triathalife: Robina Clubs Champs - have I done enough? This weekend is Race 4 of the QLD Gatorade series. The place for battle: Robina. What makes it extra special is that the race doubles as the Club Championships, which means tri clubs from around QLD will be getting every man and his dog to dust off their racing flats so they can rumble. My club, Reddog Triathlon Training, are the carryover champs and we are keen to hold onto the title. What also makes the race interesting is that it is the first one after the Christmas break. Which means many will have either over-indulged and enjoyed the feasts, while others will have taken the opportunity to log in even MORE k's in the pool, on the bike and by foot. While I thought I was somewhere in the latter part of that continuum, I did run into a few guys over the holidays who were putting my numbers to shame (someone knocked over 620k's on the bike in one 3-day period, another spent the week doing altitude training and over 9000m in accents at Falls Creek). I guess as long as you can hold off the injuries (and keep your relationships happy!) then go for it. This week got off to a frustrating start - after a HARD spin and 1km run repeats on Sunday (a group of us had set up windtrainers at UQ for the spin, then ran 1km efforts up and down the dirt track near the river - great place to train) I had a swim set for Monday. I got to the pool at just after 7am (the squad finishes then so extra lanes become free) thinking I'd have a bit of space to follow the black line. WRONG! School holidays still. It was chock-a-block! I fought my way through, quickly having to ditch my planned set and 'fartlek-ing' my way through whatever I could fit in between people (someone slow in front - 1 arm drills; a bit of space - 50m hard). I ended up giving up after 2km and went back at 6:30pm hoping that it would be better. WRONG again! I can say it did ease up at about 7:10pm... 4km of swimming all up, split over 2 sessions. I also managed a technique and recover spin on the windtrainer that afternoon (about 40 minutes, mainly including some one leg drills and efforts of high cadence over 120rpm). My bike torture chamber - when I'm not using Zone5 at ChainGang, this is where the sweat-fest happens! Tuesday morning was the Reddog track session, which is one of my favorites of the week. There is something about running on the track, and I don't seem to get bored of counting laps. In fact, I kind of find it meditative. The main set this week was 4 x 1500m efforts, with the first and third building to 80% and the second and last full-tilt boogie. Great for some speed work and training at race pace. In the evening I did the Reddog swim squad, which was great because we have dedicated lanes! No fighting for space amongst little kids duck-diving! Wednesday was a long ride, on the road for 3 hours and I included some Coot-tha repeats just to keep it interesting and to build some strength in my legs. With Falls Creek only 4 weeks away this Sunday I need to keep working on my climbing as there is a bit of it in that race. I'm lovin' the bike at the moment, being outside and feeling free (holidays will do that to you I think!). I finished the day with a light 30 minute jog, just to get my legs used to running when they are tired. One thing that has made training motivational - different locations. This is at the Glass House Mountains, spectacular views! Which brings me to today; this morning I did a moderate run with 5 x 2min quick efforts (at a bit above race pace). Again, I'm just trying to get some speed back into my running after having the time off. I've teed up a light Riverloop with our coach this afternoon (just to add some k's to my endurance for Falls) and tonight will be another squad swim, which is good as I need to build up some time in the water. A ride - run tomorrow, massage in the afternoon and light spin on Saturday and BOOM! It'll be time to race. Have I done enough? I'm not sure. I know that I have logged in some high quality sessions over the past 3 weeks. I'm feeling fit, feeling light and think that I may be at the highest point I've been in a long time. As long as I race hard, smart and can mentally keep myself in the 'hurt locker' as long as it takes, then I'll be happy. If others go faster, then my hat goes off to them for putting in the hard yards to get there. Hopefully my massage will help me out. I always like to get a massage in the week before the race. I find it flushes out some of the 'heavyness' from training and makes me feel fresher for the race. I try to get one either Thursday or Friday, bearing in mind that the closer to the race it is, the less pressure you should get. Try to find a massage therapist that knows their stuff as you don't want to be sore from the massage on race day morning! With the heat cranked up to FULL it will also be important to not only hydrate well on Sunday, but also in the build up. I would suggest starting to think about this sooner rather than later. Make sure you are getting enough fluids over the next few days, consider having a sports drink (such as Endura) on Saturday and remember that if you feel thirsty you are already well and truly behind the eight-ball. If you're running short I know ChainGang Performance Bikes and Active Stride both sell Endura products. Also, check out USM Events as wave starts have been posted. As I am 'kicking off' at 8:56 I know I will need to have extra fluids with me just to get me to the start line in the morning! If you have a late start like me, try to find some shade once you have set up in transition. A good sign of dehydration! 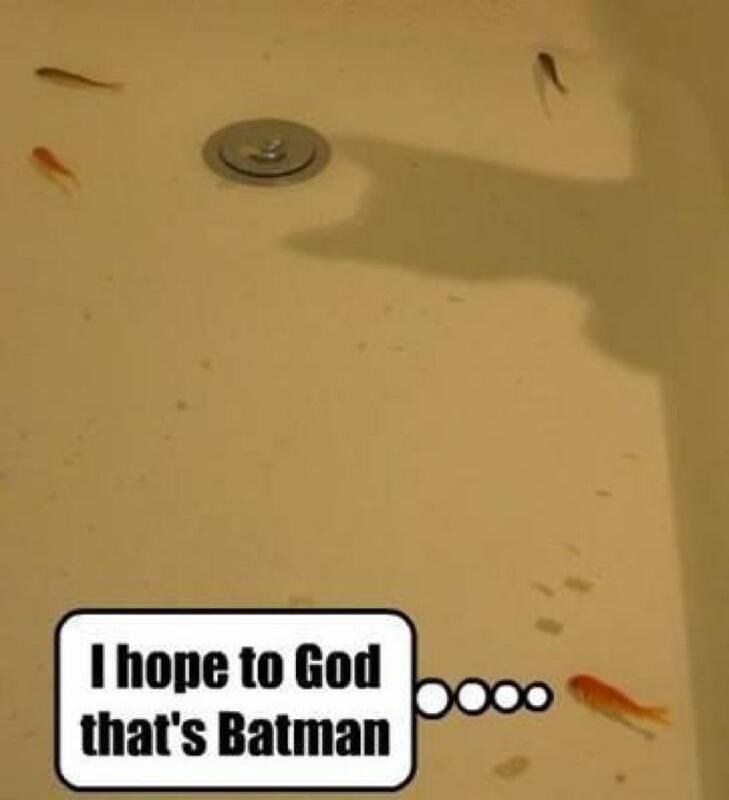 For a quick start on Sunday, pretend you're this goldfish with the mysterious figure looming behind you! Best of luck and great reading!!! Once again you have inspired me to get up and do something!!!! (Those xmas and new year treats are sooo BAD!) Happy racing and hope that number one looms for you!!! 5th place in my category, a tough day at the office but still a bit of fun. Check out my latest blog for the breakdown. Did you race?